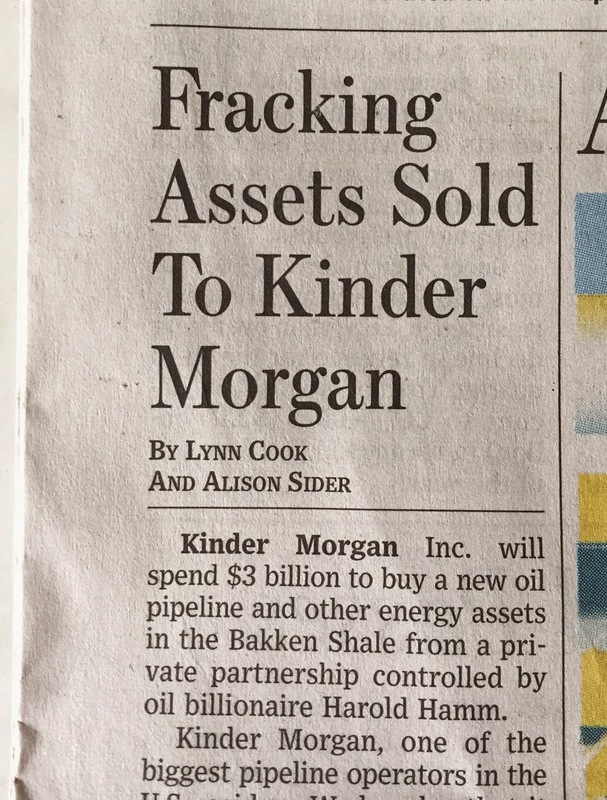 The Wall Street Journal greeted me this morning with the headline "Fracking Assets Sold to Kinder Morgan." "Hmm," I thought, "Kinder Morgan is changing its business model?" Uh, no, the Journal is sloppy in developing its headlines. Can we please cut down on the misuse of the word "fracking?" I expect better - this is the Wall Street Journal, not Mother Jones. Actually, Kinder Morgan is buying midstream assets in the Bakken Shale. The better headline would have acknowledged KMI entering the Bakken for the first time. Or maybe something noting a potential conflict of interest between Continental Resources and CEO Harold Hamm in the ownership of said midstream assets (hmm, smells like Chesapeake and Aubrey McClendon). I've grown weary of mainstream media outlets referring to drilling and exploration as "fracking." Fracking is just one aspect of the drilling and production process. Granted, it has become one of the more recognizable and controversial aspects, but it is still only part of the overall process. This article isn't even about drilling - it's about pipelines! It seems that editors are more interested in provoking readers than accurately representing the story. In the online version at wsj.com, the headline is a more sober "Kinder Morgan Buys Bakken Shale Assets in $3 Billion Deal" - much better. Maybe they had more time to think about it.